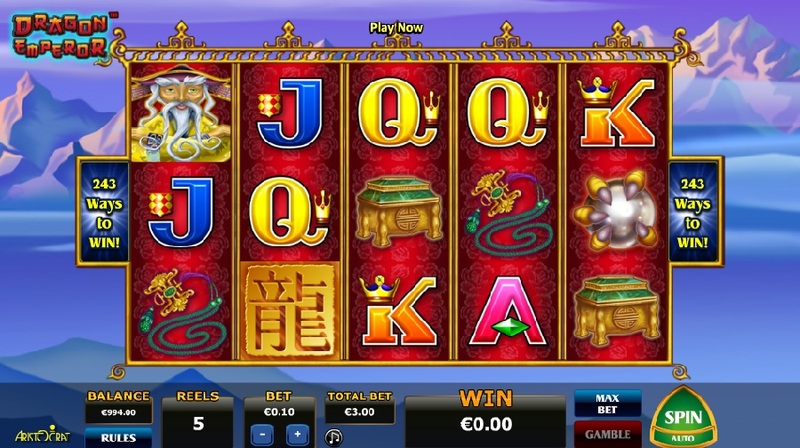 Dragon Emperor slot is a Oriental-themed game from the Australian gaming company Aristocrat. Their partnership with NextGen Gaming has seen a steady flow of popular Aristocrat titles make their way online. Examples include the British-themed Big Ben slot, the feline-inspired Miss Kitty and the prospecting slot Where's The Gold. Dragon Emperor is part of Aristocrat's 'Reel Power' series, and like many of their slots, made its name in land based casinos before being redeveloped for online play. Not many developers have the luxury of road testing their video slots in casinos before releasing them online, but Aristocrat do and it tend to work pretty well for them. The highest paying symbols in Dragon Emperor is the Wise Man (who has a very impressive beard) and the Dragon claw holding a pearl. 5 of a kind (5OAK) of these will pay 1000 coins and 800 coins respectively. The lower value symbols, in descending order, are the golden chest, golden necklace and then the standard A-K-Q-J. The Dragon symbol, which appears only on the 5th reel, is stacked. If all 3 positions on the 5th reel are filled with the Dragon symbol then you will be awarded a special 'Reel Shuffle' feature, which sees all 5 reels jump up and shuffle into new positions. The Dragon symbol will replace all other symbols, except the Chinese Writing scatter symbol. To trigger the free spins feature in Dragon Emperor slot, you need to land at least 3 Chinese Writing scatters from the left most reel - it will not trigger if they land randomly across the 5 reels. You will will be rewarded with 7, 10 or 15 free spins if you get 3, 4 or 5 scatters. There is an initial win just for activating the bonus, which is 2x, 10x or 40x your total bet (depending on how many scatters appear). During the free spins you will get a set of bonus reels, different to the reels in the base game. One very noticeable difference is that there are more stacked Dragon symbols on reel 5. Just as in the base game, the 'Reel Shuffle' feature is present in the free spins. Both the free spins and the Reel Shuffle can retrigger at anytime in the feature, potentially leading to some very handsome wins. 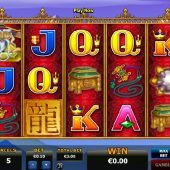 Dragon Emperor slot joins a wide selection of online Aristocrat slots which have an Oriental theme. The likes of 5 Dragons, 50 Dragons, Choy Sun Doa and Double Happiness are just a few they already have out in this genre. It is however a welcome addition, with its unique 'Reel Shuffle' feature and nice mix of base game and feature wins. Dragon Emperor is arguably on the high side or medium in terms of volatility, which may mean that players who like a quicker win rate will likely be put off. The theoretical RTP of 95.19% is not the best we have seen from the wide choice of online slots out there. That being said, this is an enjoyable slot and I could see it gaining its own set of fans, who get hooked on those shuffling reels.